The indefatigable Bronwen Handyside, Secretary of Hackney Keep Our NHS Public, has forwarded details of how you can contact Lords about the proposed dismantling of the NHS. 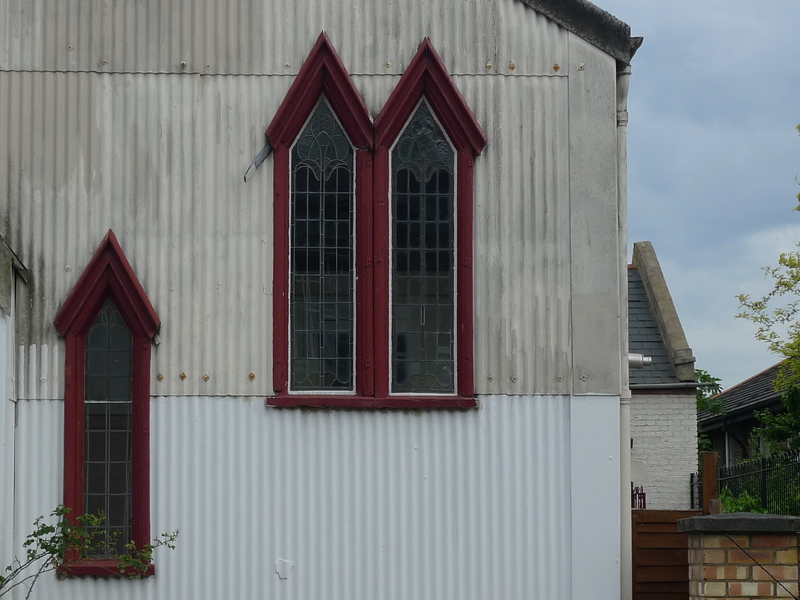 This battered corrugated iron church on Shrubland Road looks like it would be more at home in Alabama, or perhaps a Flannery O’Connor novel, than in Dalston, and I have always been intrigued by it. So I was happy to open a copy of Hackney: Modern, Restored, Forgotten, Ignored, and there it was. 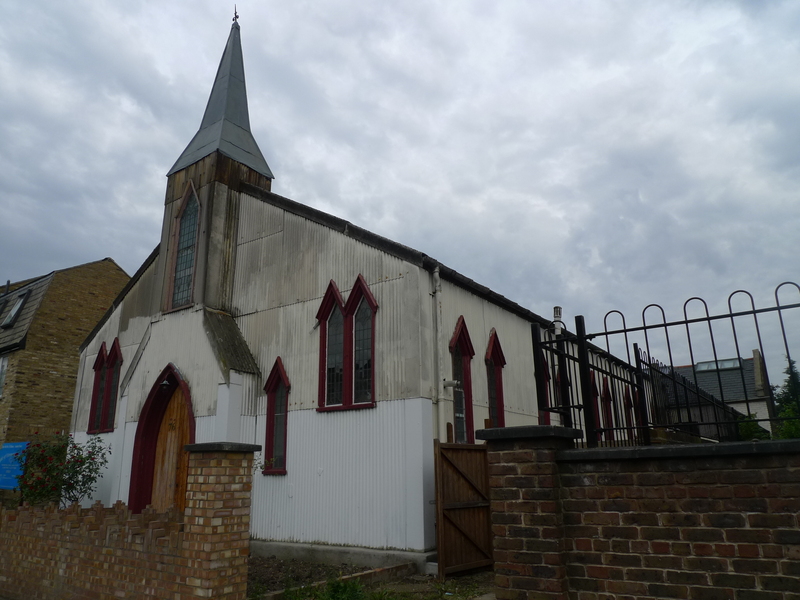 Built in 1858 at a cost of just £1250, it’s believed to be the oldest surviving example of an iron church in existence, a ‘tin tabernacle’ as they are called. Published by The Hackney Society and available through their website or from Pages of Hackney, I found this book at the local hairdresser of all places, and went out to buy a copy soon afterwards. 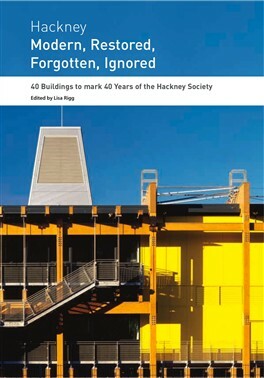 It looks at 40 buildings in Hackney to mark 40 years of The Hackney Society. As well as historical buildings it features contemporary homes and new schemes such as Adelaide Wharf and Sutton House, and is beautifully photographed and well researched. The saddest chapter, ‘Forgotten’, looks at buildings that have been demolished. A bit of a gem, and a fantastic book for anyone interested in architecture, history or Hackney. So I became a British citizen a few weeks back at Hackney Town Hall. Of course, I’ll never be truly British. The entire Australian cricket team are still dead to me, for a start*. But I quite liked the idea of making the decade I’ve spent here official, and Old Blighty has been good to me. This rite of passage coincided with my reading ‘Watching The English’ by anthropologist Kate Fox and although it’s somewhat reductive, I wish I’d been handed it on arriving at Heathrow in 2001 with a single battered suitcase (the exit strategy won’t be quite as straightforward). She points out so many little things that I’ve sort of absorbed over the years, but would have benefited from knowing outright. For example, it’s a little rude to introduce yourself at a party. That’s seen as American. And the greater your power, or intelligence, or status, the more you should take the piss out of yourself (this is why friendly UK doctors are so liked in Australia, while the homegrown ones tend to have a God complex). And while you should do a good job at work, you should never take it too seriously. That’s being a jobsworth (one of my favourite English terms). Pubs are for banter only, never serious conversation. And the queue is sacred. I was reminded of this last point when registering at the Town Hall. First you are told to mill about, and then once it looks reasonably busy a man calls, ‘Form a queue to get your documents checked.’ I resisted the urge to make an obvious joke about this being part of the test, because although most did a pretty good job the woman behind me practically climbed on top of me to hurry things along, and I don’t think she would have got it. I did give her a little tut, though, which is the correct way to deal with this sort of thing. Then we waited around for a while upstairs before being ushered into the council chambers for a discussion of the how ceremony should run while our families waited outside. It became dismally apparent at this point that there was a definite mismatch between how Hackney Council would like these ceremonies to roll out – with dignity and a certain sense of occasion – and how they usually run on the day. Hanging over everything the woman said was the heavy shadow of former ceremonies that hadn’t gone so well, with complaints filed, tears shed and meetings held. ‘Even if you’re not giving your oath, please show respect to others by keeping quiet when they are giving theirs,’ we were told, and: ‘If your children are being noisy they will have to leave.’ [Later, children were kicked out for being noisy, she was deadly serious]. And, ‘When you come to give your oath, you’ll see on the paper that it says, ‘I (name) do solemnly, sincerely….etc’. When you come to read it out, don’t read ‘I, name. Please insert your own name there.’ This is the sort of thing I do, so I crossed out ‘name’ and wrote in my own. I didn’t think anyone else would be so silly, though, until the real ceremony began and the second person said, ‘I, name, do solemnly….’ And then had to start again. Once we’d all sworn allegiance to the Queen we came up to receive our certificates, had our photos taken and were given our certificates by the rather queenly deputy Speaker Linda Kelly, who welcomed each us personally and told us that there are around 200 languages spoken in Hackney, and that when she came over from India as a child she had no such ceremony, so we were very lucky. I was expecting tea and digestives at this point (at the Australian ceremony, I’m told, you get lamingtons), but I suppose these are miserable times for that sort of thing. We were, however, given an I Love Hackney bag. Later, as I was walking towards Hackney Central for a spot of trolley rage in Tesco, I saw something that summed up what I love about England: the polite tolerance allows a lot of people to jolly along, a lot of the time, on a very crowded little island. To which the man nodded in a wise sort of way and remarked, ‘Now you can go and get pissed’. It’s funny how the minute the clouds come in – like this morning – I automatically feel like turning on the oven and baking something. 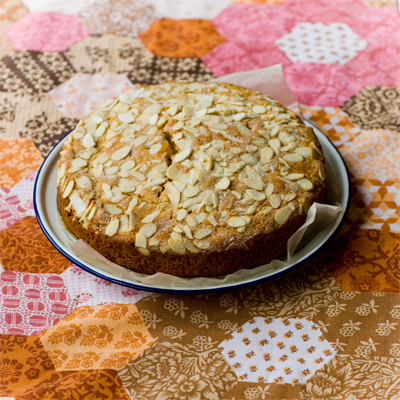 So I thought I’d recommend one of my favourite cooking blogs: Coco & Me (the pic to the left is taken from the blog). 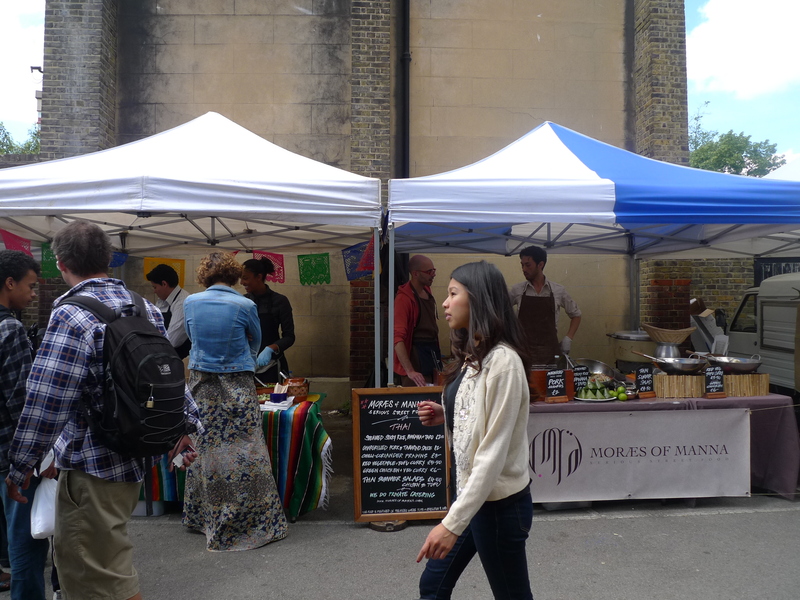 Tamami is a Japanese mother-of-two who has a stand at Broadway Market. 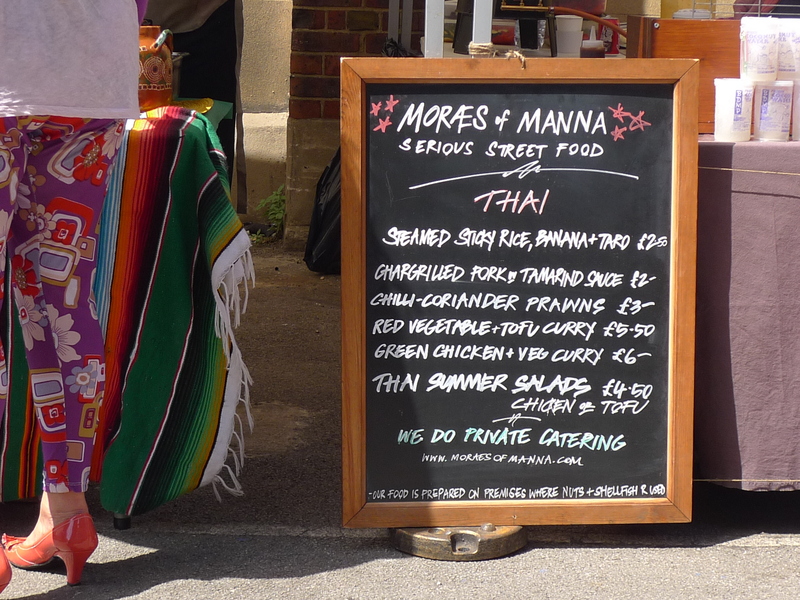 Her former career as a graphic designer is evident in the stencil-work on her chocolate tarts and the general gorgeousness of her stall, and her love of food is apparent in the size and deliciousness of her brownies. PS Tamami, if you read this, can I ‘borrow’ a photo from your blog to illustrate?